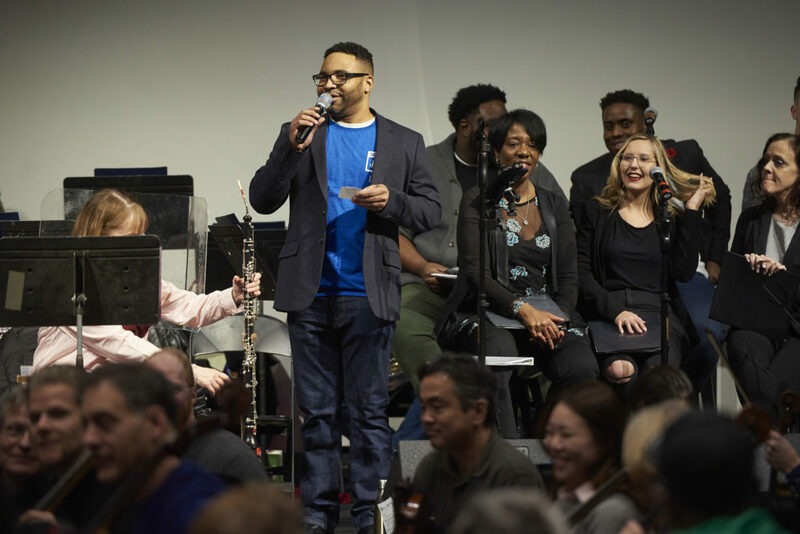 With its coffee-house atmosphere, and its eclectic mix of pop, jazz, blues, folk, world and classical music, the Collaborations Music Event is a must-see. The event joins Minneapolis College music faculty and music students in a wide variety of musical offerings. MC’d by Minneapolis College Music Faculty member Joel Sundseth. 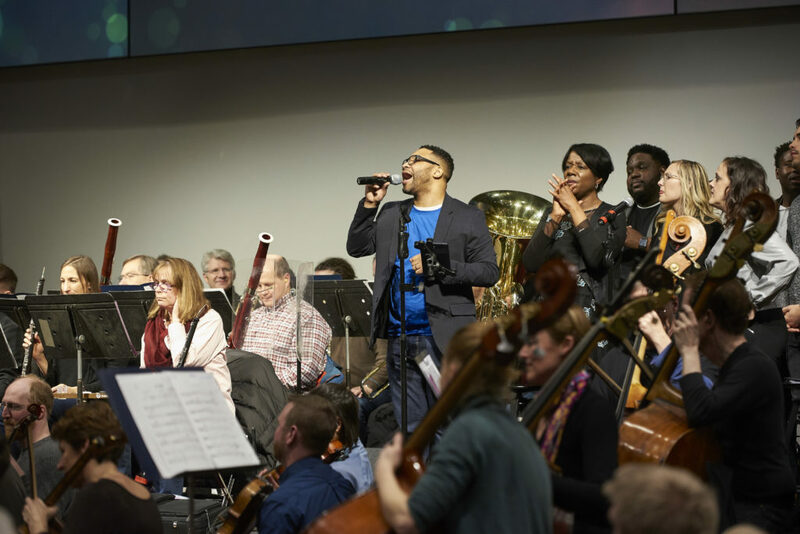 Be prepared to be amazed, inspired and entertained – you never know what you will hear at the Collaborations Music Event! This event is co-sponsored by the Minneapolis College Music Department and the School of Design and the Arts. 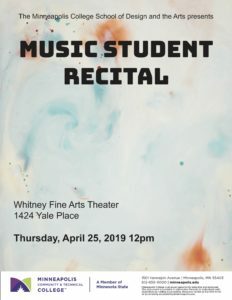 The Music Department at Minneapolis College presents its annual Student Recital on April 25 from 12-1 in the Whitney Fine Arts Theater on the Minneapolis College campus. 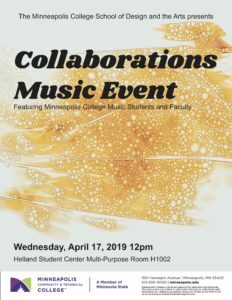 This event will showcase students who have been studying applied music at Minneapolis College. 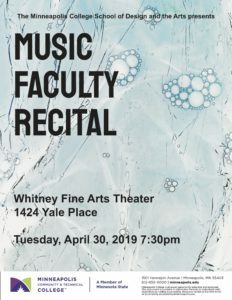 The Music Department at Minneapolis College presents its annual Music Faculty Recital on April 30 at 7:30 pm in the Whitney Fine Arts Theater on the Minneapolis College campus. 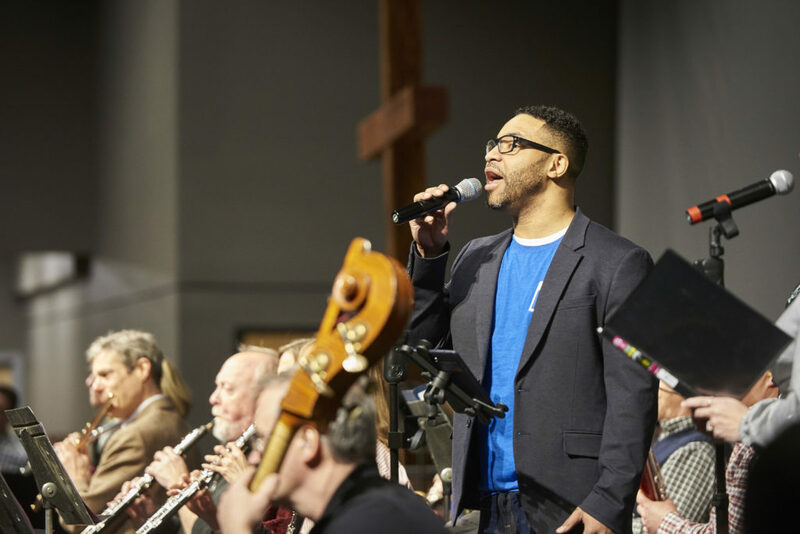 Members of the music faculty are experienced performers, in a variety of styles from jazz and blues to folk and classical. This melding of musical traditions creates an eclectic and engaging event. Winter Blues? How about a little singing to take them away? Join Minneapolis College music faculty members Liz Pauly and Sarah Greer along with the Minneapolis College Choirs for a session designed to help chase away the winter blues. By the time you leave this session you will have learned several fun songs made to be sung in community, participated in group improvisations, and learned some breathing, posture and stretching exercises to help calm and relax your winter-weary body. Minneapolis College students participate in Singing for Stress relief community sing event. Posted in Uncategorized	| Comments Off on Winter Blues? How about a little singing to take them away? 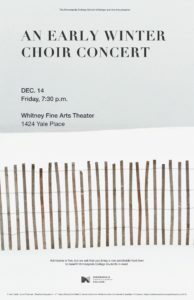 Minneapolis Community and Technical College will present an Early Winter Concert, featuring the Minneapolis College Concert Choir and Vocal Ensemble Friday December 14 at 7:30 pm in the Whitney Fine Arts Theater, 1424 Yale Place, on the Minneapolis College campus in downtown Minneapolis. The concert, directed by Dr. Elizabeth Pauly and accompanied by Christopher Wolter will feature the choirs’ characteristic blend of art music with folk and traditional music from across the globe. Selections include compositions and arrangements by Stephen Hatfield, J. David Moore, Abbie Betinis and Brian Tate. Joining the choirs will be guest artist flautist Julie Johnson. A reception in the Fine Arts lobby will follow immediately after the concert. Light refreshments will be served. Children are welcome. 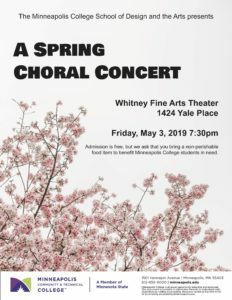 Admission to this concert is free, but the choirs ask that you bring a non-perishable food item which will benefit Minneapolis College students in need. Want a flier to post or share with friends? 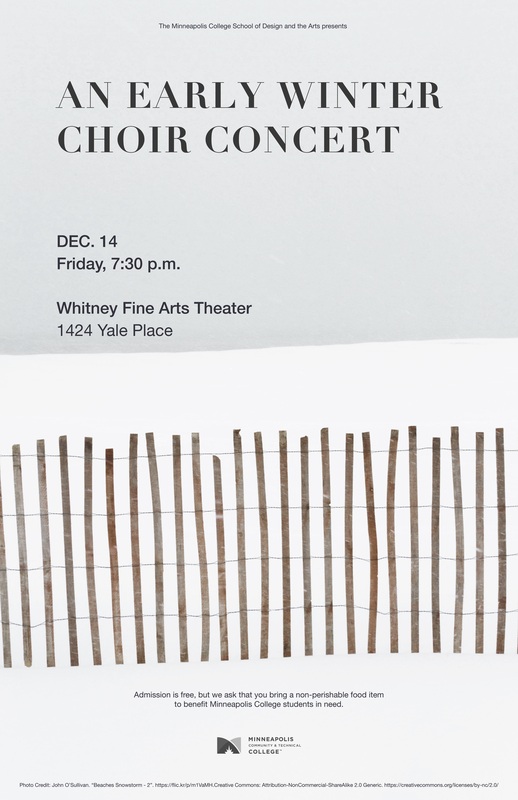 Early Winter Choir Concert Flyer. The Music Department at Minneapolis College will present a short lunch time concert on September 26th at 12:00 noon in T1400 – T Building Plaza on the Minneapolis College campus. The event is free and open to the public. Members of the music faculty are experienced performers, in a variety of styles from jazz and blues to folk and classical. This melding of musical traditions will create an eclectic and engaging event. Hope to see you there! Help us spread the word – here is a flier you can post.